Three detained Russian sailors arrested in 2015 have been released 24 hours after the visit by Russian MPs to Presidency Council deputy chairman Ahmed Maetig. However the foreign ministry in Moscow is now calling for the release of three more Russians held after the arrest in June of another tanker. The trio of sailors from the Mekhanik Chebotarev were accused of fuel smuggling when their tanker was seized off Zuwara in September 2015 returned to Russia yesterday. A specially-chartered aircraft took them from Mitiga to the Chechnyan capital Grozny. Adam Delimkhanov one of the MPs who saw Maetig had made at least two other visits to Tripoli in the last year. A cousin of Chechen ruler Ramzan Kadyrov he appears to have spearheaded efforts to release the men. Between the meeting with Maetig and their flying out yesterday, according to the Russian foreign ministry, they apparently had some sort of trial. It is unclear what the court’s finding was. Sadiq Al-Sour, head of the Public Prosecutor’s office has made no comment. Moscow said that it was grateful to everyone who had helped secure the release of Andrei Krynin, Stanislav Sirotkin and Valery Savitsky. 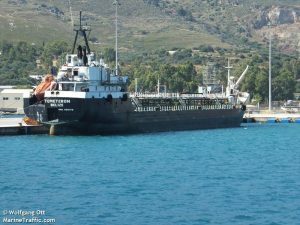 It said however that three more Russians, captain Vladimir Tekuchev, chief officer Samoilov and senior engineer Pashchenko were still being held after the arrest this June of the oil/chemical tanker Temeteron, again on suspicion of fuel smuggling. They are being held with an unknown number of other members of the multinational crew. “All possible measures have been taken to secure their release, “ said a foreign ministry statement today, “which is difficult due to the military and political tensions that have persisted in Libya for the past several years and the lack of central control over several regions”. The ministry repeated its advice that Russians do not visit Libya. It is unclear what has happened to the two arrested tankers.